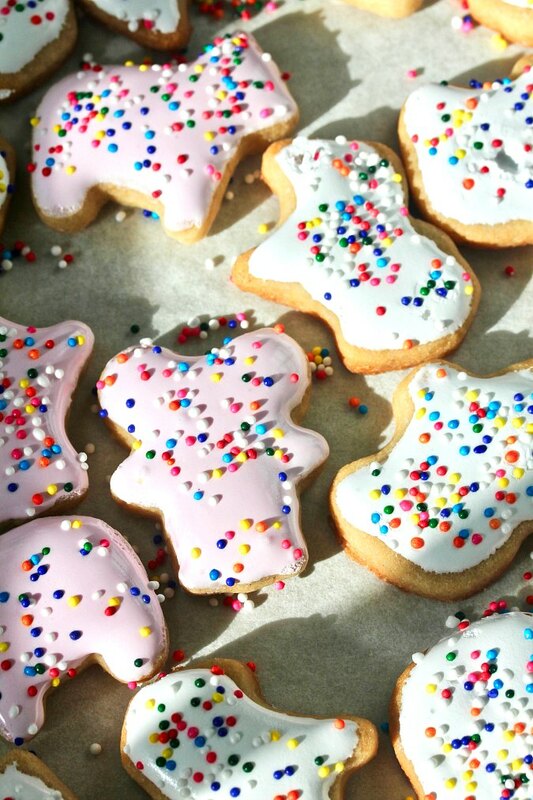 The dough for these copycat animal cracker cookies is super easy to make too. Once you mix the dough, you roll it out between sheets of parchment or wax paper, and then chill it for an hour (and up to 2 days) before cutting the cookies. The only negative thing about these cookies is that they are really hard to stop eating. They're so small and "poppable!" You can make the dough one day, bake the cookies the next day, and decorate them the day after that. 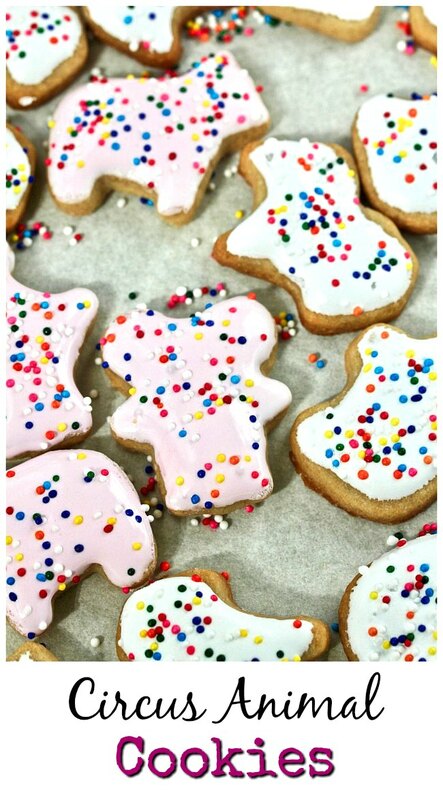 You can also bake and freeze the animal crackers up to three months in advance, and decorate them when you are ready. For the white cookies, I tried spreading the icing onto the cookies with small offset spatula, but it was really tedious and edges were sometimes kind of jagged. For the pink cookies, I dipped the cookies into the icing and used the small spatula to help remove excess icing before setting the cookie down on a parchment lined baking sheet to let the icing smooth out. While it took the icing longer to dry because it was thicker, this was much easier. I used royal (pain) icing on these animal cookies, but you can use a vanilla powdered sugar glaze to make it easier. What is the difference between royal icing and a powdered sugar glaze? Royal icing includes meringue powder (or sometimes egg whites), which helps it harden no matter the consistency. It's often used for precise cookie decorating and making gingerbread houses. Glaze icing is typically powdered sugar mixed with water, juice, or milk and sometimes some corn syrup. It's easy to work with, but softer than royal icing. It will still harden enough that you can stack the cookies. While I haven't tried this, if you really want to duplicate the Mother's brand of circus animal cookies, you can try dipping the baked cookies in thinned candy melts, or, if you want to get really fancy, melted white chocolate. Mini Cookie Cutters: When I decided I wanted to make these cookies, I went a little crazy and bought these, these, and these cookie cutters. I ended up using the Noah's Ark ones for this batch, but can't wait to try the rest. I'm really excited about the set with the fish to make copycat goldfish cheese crackers. This rolling pin with thickness rings. This one saves the day when the recipe calls for the dough to be rolled out to an exact thickness, in this case 1/4 inch thick. By using the rings, you are assured that the dough is uniformly thin from edge to edge. You will also need half sheet pans and parchment paper or Silpat silicone baking mats. I'm a huge fan of King Arthur Flour's pre-cut parchment paper and buy mass quantities when they have free shipping. I also like plain old wax paper for rolling out the dough. 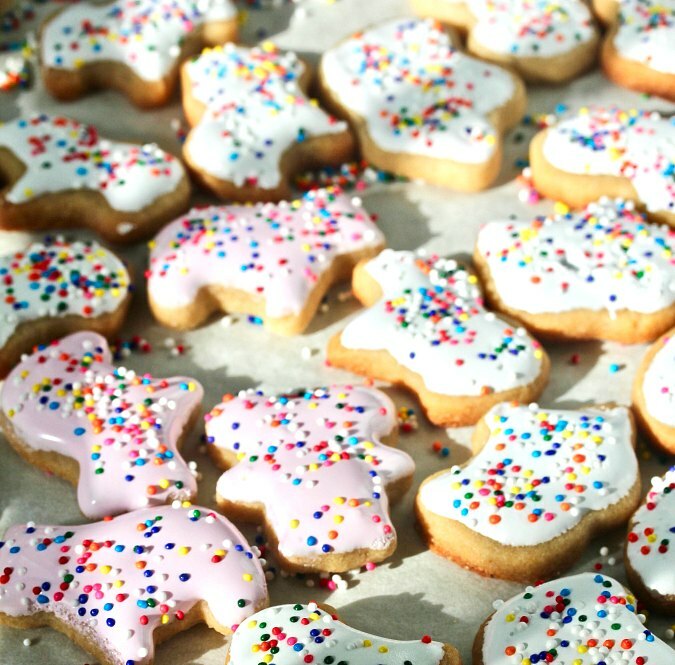 To make the pink icing, after you have iced half of the cookies with the white icing, add a drop of regular or gel food coloring to the remaining glaze to color it. 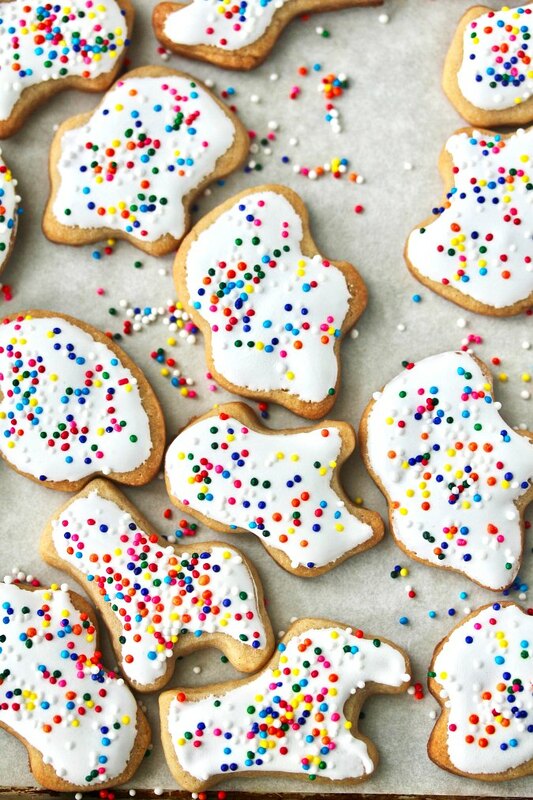 This month the Creative Cookie Exchange members are baking copycat cookies. I can't wait to try these! In a medium bowl, whisk together the flour, cinnamon, baking powder, and salt. In the bowl of a stand mixer with the paddle attachment, beat the butter and sugar on high speed for about 2 minutes, until smooth. Add the egg and the vanilla and beat on high speed for an additional minute. If necessary, scrape down the sides of the bowl and beat for an additional minute. Add the flour mixture to the butter mixture and beat on low until just combined. Divide the dough in half and place each half on a piece of parchment or wax paper. Press each half into a 1/2 inch disk and top with another piece of parchment or wax paper. With a rolling pin, roll the dough out into a 1/4 inch thick oblong between the two pieces of paper. Place it on a baking sheet. Roll the second piece of dough out between two pieces of parchment/wax paper to 1/4 inch thick. Stack it on top of the other piece of dough and refrigerate for at least an hour and up to two days. Preheat the oven to 350 degrees F. Line three half sheet pans with parchment paper. 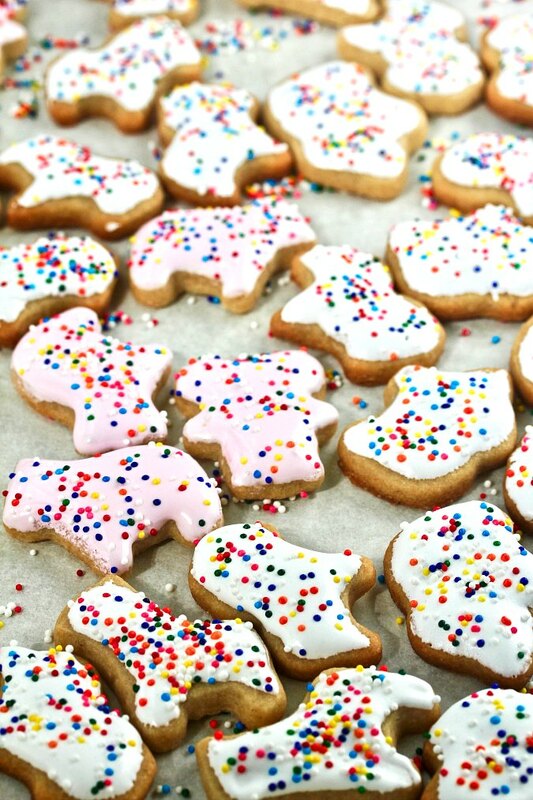 Remove one dough piece from the refrigerator and cut the dough with the cookie cutters into shapes. Re-roll any scraps and recut the dough with the cookie cutters. Place the cut pieces of dough about 1 inch apart on the baking sheet and bake for 9 to 10 minutes. Cool on the pan for 5 minutes and then move the baked cookies to a wire rack. Prepare the glaze of your choice (see below) and dip the cookies. Sprinkle with nonpareils and let harden. Once you have dipped and decorated half of the cookies, add pink food coloring to the rest of the glaze, and dip and decorate the rest of the cookies. This recipe was slightly adapted from Sally's Baking Addiction. Here is her royal icing recipe. It makes way more than you'll need, but you can freeze leftovers. Here is her glaze recipe.